WASHINGTON — President Donald Trump believes that now is not the time to talk about gun control in the immediate aftermath of the deadliest mass shooting in modern American history, the White House said Monday. Asked about renewed pleas from lawmakers for stricter gun control measures, White House Press Secretary Sarah Huckabee Sanders said it was "premature" to talk about potential legislation before all the facts about the Las Vegas mass shooting are known. "There's a time and place for a political debate, but now is the time to unite as a country," Sanders said, noting "there will be certainly time for that policy discussion to take place, but that’s not the place that we’re in at this moment." But Sen. Richard Blumenthal, D-Conn., whose home state was the site of the tragic Sandy Hook Elementary School shooting in 2012, disagreed. "If not now, when?" he asked. "When I saw this horrific tragedy unfolding this morning my heart broke but my stomach churned with anger because Congress has been complicit in failing to act," he told NBC News in response to Monday's White House briefing. While the White House advocated pausing before diving into a policy debate, as a candidate Trump was quick to bring policy into the fold in the face of tragedy. After the deadly Pulse nightclub shooting in Florida in June 2016, Trump tweeted and campaigned on his Muslim ban, citing the need for toughness in the face of terrorism. Sanders told reporters there was a difference between being a candidate and being president. While Hillary Clinton on Monday attacked the NRA and legislation that would make gun silencers more easily available, Sanders called it "easy" for the failed Democratic presidential hopeful to criticize. "The only person with blood on their hands is that of the shooter," Sanders said, adding that it "isn't the time for us to go after individuals or organizations." Sanders pointed to Chicago, saying that the city's strict gun laws have not stopped the thousands of gun-related deaths there. The goal of any legislation, she said, should be measures that would have a real impact. 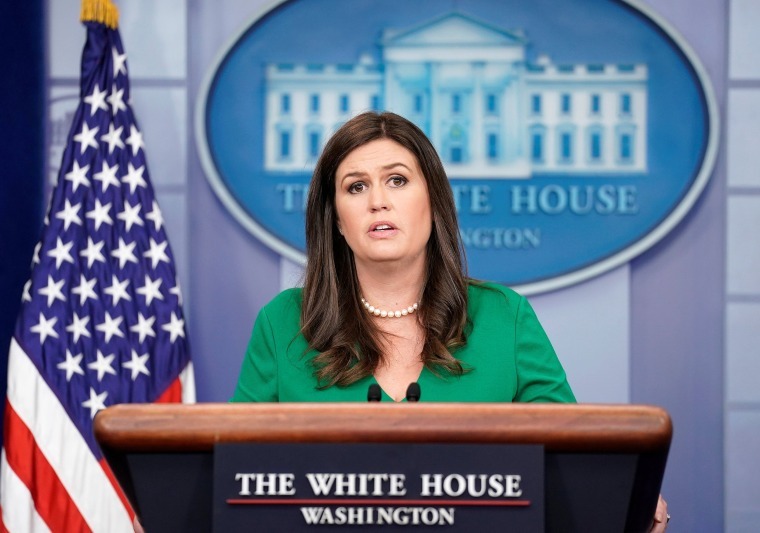 At the beginning of her press briefing, Sanders' voice broke as she described several individual acts of heroism in the face of the Vegas shooter's "evil" as he sprayed bullets down on a country music concert, killing at least 58 people and wounding more than 500. "What those people did for each other says far more about who we are as Americans" than the shooter's actions, Sanders said.